Founding publisher of the Los Angeles based African-American newspaper, the Sentinel, Leon H. Washington Jr. was born in Kansas City, Kansas on April 15, 1907. Washington, along with his two other siblings, was born to his parents, Leon and Blanche Washington. Young Washington spent much of his early life in Kansas City, Kansas, where he attended Summer High School from 1921 to 1925. Upon his graduation from high school, Washington soon moved to Topeka, Kansas, where he attended Washburn College (now Washburn University) from 1925 to 1929. Washington’s first post college job was as an independent clothing salesman in Kansas City, Missouri. 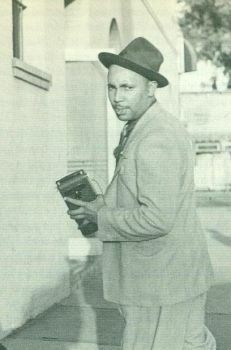 Washington moved to Los Angeles, California in 1930 at the urging of his cousin, Loren Miller, who was then building his own career as a prominent civil rights attorney in the city. Miller referred Washington to Charlotta Bass, the editorowner of The California Eagle, then the oldest and largest black newspaper in the state. Washington accepted employment as an advertising salesman for the newspaper. After three years, Washington left his advertising position and started his first newspaper, which he originally called The Eastside Shopper. This was a free-circulation newspaper that catered to African-American audiences, especially residents in the Central Avenue district. After a year, readership had increased, allowing Washington to change the name of the paper to the Sentinel and make it a subscription based publication. The Sentinel soon became a rival to The California Eagle. In 1940, Washington married the paper’s photographer, Ruth Brumell. By 1948, Washington experienced a string of health problems, which culminated in a stroke. This health scare forced him to appoint his wife as an assistant publisher, and business manager for the paper. In the first two decades of its existence, Washington’s Sentinel championed economic equality and entrepreneurship for its mostly African-American readers in the Los Angeles community. In 1949, Washington called for a series of non-violent demonstrations against white merchants who operated in the African-American community but who refused to hire black workers. Because he was jailed in one of the demonstrations, he subsequently became more widely admired in the local black community. Washington revived the 1930s boycott slogan first heard in New York and Washington, D.C., “Don’t Spend Your Money Where You Can’t Work.” Washington was referred to many as “Colonel,” a rank bestowed upon him by the Kentucky Governor Bert T. Combs. Washington continued as acting publisher for the paper through the 1950s and 1960s. In 1972, it reached a peak circulation of 39, 277 and had a staff of 50. Two years later, on June 17, 1974, Washington passed away in Los Angeles at the age of 67. Now his widow, Ruth, assumed complete control as both editor and publisher of the Los Angeles Sentinel. She served in that capacity until her death in 1990. The Sentinel is still in operation to this day. Augustus, W. Low and Virgil A. Clift, Encyclopedia of Black America (New York: Da Capo Press, 1984); Yussuf Simmonds, “Legends of the Past; Col. Leon H. Washington, Jr.; April 15, 1907 -- June 17, 1974,” Sentinel, Dec. 9 2004; http://www.lasentinel.net/About.html; A.S. Doc Young, “Colonel Leon H. Washington Jr.,” Sentinel, Apr. 14 1984; Los Angeles Sentinel, “Legends of the Past,” Sentinel, Dec. 16 2004. York: Da Capo Press, 1984); Yussuf Simmonds, “Legends of the Past; Col.
Sentinel, “Legends of the Past,” Sentinel, Dec. 16 2004.